Microsoft says that its new Windows tablet – the Surface 3 – is the ‘perfect balance of performance and value’. But in our latest tablet tests, it failed to meet our Best Buy standard. We’ve just put five models through our rigorous lab examinations, with the latest tablets from manufacturers Samsung and Lenovo joining the Surface 3. One model flew through the tests, combining a brilliant battery with razor sharp performance and effortless ease of use. With a mighty test score of 76%, it joins our selection of other Best Buy tablets. Want to know the tablets that have impressed us most? See which to seek out by heading straight to all our Best Buy tablets. Available in 64GB and 128GB versions and running a full Windows 8.1 operating system, Microsoft says that the Surface 3 straddles the line between tablet and laptop, giving the user the best of both worlds. It’s certainly quick – it features a Quad Core Intel Atom x7 processor that loads up apps and programs in a jiffy. Unusually, it has a full-sized USB port for transferring files. And we like the adjustable kickstand too, which allows you to position the tablet to three positions. 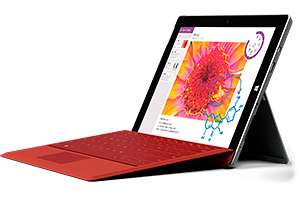 But the Surface 3 is just too big and bulky to compete with the very best tablets around. At 622g, it’s almost 50% heavier than flagship tablets from Apple and Samsung. And if you truly want it to replace your laptop, you’ll have to shell out a further £110 for its bespoke Type Cover keyboard. To see the full review of the Surface 3 and all the tablets we’ve tested, click through to our tablet reviews. Our unique lab tests scrutinise every aspect of the tablets we review – from the vibrancy of the screen and clarity of sound, to the longevity of the battery and quality of their cameras. Plus, we use feedback from our members to decide what importance to give each element of the test, so you can be confident that a Best Buy will be ideal for your needs.